With Christmas fast approaching I am hoping that champion trainer Paul Nicholls can play Santa Claus and provide us with a few festive winners this weekend. The Caspian Caviar Gold Cup is the feature race at Cheltenham on Saturday and Paul has won this three times in the last six years. He could saddle three but it is Art Mauresque that catches my eye. He ran a good race to be sixth in the Paddy Power Cup over course and distance and should strip much fitter now. Nick Schofield takes over in the saddle and I expect him to reverse the form. Nicholls also runs his Greatwood Hurdle scorer Old Guard in the International Hurdle. It is a big jump from handicaps to Grade Two races but he won so well in November that he could just surprise the likely favourite, Peace And Co. This horse won the Triumph Hurdle in March but is having his first outing since then and Old Guard can perhaps make his race fitness tell. 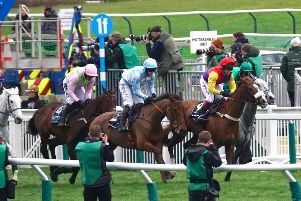 The Channel 4 cameras are also covering four races from Cheltenham on Friday. My nap of the weekend, Any Currency, runs in one, the Cross Country Chase. At the Paddy Power meeting Any Currency was just touched off by Josie’s Orders when trying to concede 23lbs. On Friday he meets him at level weights. Despite being 12-years-old he just loves this unique course and never knows when he is beaten. Yorkshire based Sue Smith rarely runs horses at Cheltenham but she has entered Wakanda for the long distance chase on Friday. Wakanda jumped like a bunny when doing this column a favour last time out and it will be interesting to see him tackle the big Cheltenham fences. He could yet be saved for a crack at a listed race at Ascot next week but will carry my cash if racing out on Friday.